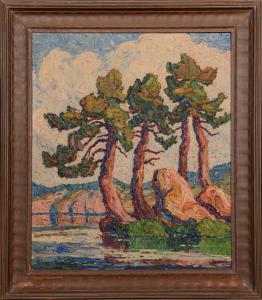 The top lot of the sale was this painting by Sandzen titled Cedars and Rocks. It soared to $160,000. 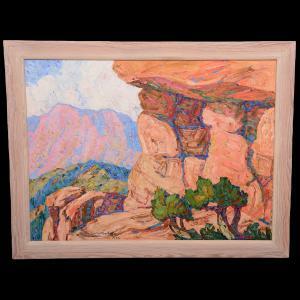 This painting by Sandzen was officially untitled but might be Glimpse of Mountain Lake. It sold for $90,000. 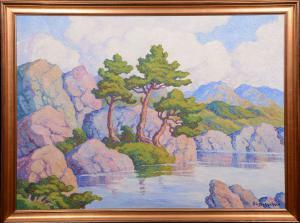 This original oil painting by Sandzen titled Lake in the Rockies finished at $75,000. Galle signed figural table lamp with a French cameo art glass shade ($17,000). Rare Tiffany Cypriot art glass vase boasting gorgeous colors, 5.5 inches tall ($6,000). Woody Auction celebrated the grand opening of their new Douglass, Kansas auction hall with a major antique and fine art auction on Saturday, February 24th. DOUGLASS, KANSAS, UNITED STATES, March 8, 2018 /EINPresswire.com/ -- DOUGLASS, Kan. – Woody Auction celebrated the grand opening of their new Douglass auction hall with a major antique and fine art auction on Saturday, February 24th, one that featured four oil paintings by renowned Swedish-born Kansas painter Birger Sandzén (1871-1946), plus outstanding collections of Royal Bayreuth, Daum Nancy, Galle, Tiffany, Pairpoint, art glass and period American furniture. The numbers tell the story of a premiere auction event that was a success by any measure. Nearly 1,000 people registered to bid online (via the bidding platform LiveAuctioneers.com), and 2,475 bids were placed over the Internet, for a total of 108 winning bids. The number of visitors to the auction catalog online on auction day was a staggering 10,932. Also, 32 absentee bidders placed bids on 207 items. Following are additional highlights from the auction. All prices quoted are hammer. All lots sold to the highest bidder, with no reserves or minimums. The McCaslin Royal Bayreuth collection of 132 items out of Indiana featured many of the rarest animal forms available. A private collection from Illinois presented a great selection of Daum, Galle, Tiffany, Pairpoint, pattern glass and additional quality art glass. A period furniture collection showcased Meeks, Wooton, Hunzinger and other makers. Also sold were bronze statues, lovely brides baskets, and more. 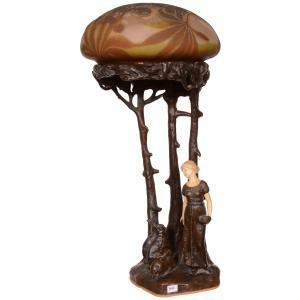 A fantastic figural table lamp with a signed Galle French cameo art glass shade having a carved pink and green floral design with elaborate interior floral carved highlights, on a figural bronze base artist-signed “F. Gopnik”, lit up the room for $17,000. Also, an all original Tiffany desk lamp, 15 inches tall, with a signed “L.C.T. Favrile” decorated art glass shade and signed on the weighted base, made $7,000. Furniture attracted keen bidder interest. A Wooton (Indianapolis) American Renaissance Revival two-hinge, standard grade patent desk, walnut with burl walnut and birds-eye maple highlights, circa 1874, in outstanding condition, went for $12,000; while a couch and parlor chair set by Meeks in the Stanton Hall pattern, laminated rosewood and with both pieces having red velvet upholstery, realized $3,250. A figural bronze statue signed “Raoul Verlet” (Fr., 1857-1923), titled Cerberus (in mythology a multi-headed, monstrous dog, guarding the Gates to Hades), 39 inches tall and having the foundry mark of “Ferdinand Barbeditenne Paris”, gaveled for $4,500. Also, a Moorcroft art pottery vase in the Eventide pattern, with beautiful colors and a tree and mountain scene décor, 10 ½ inches tall, garnered $3,250. Vases by Tiffany and Daum Nancy consistently brought high prices. A French cameo art glass vase signed Daum Nancy, 15 ¼ inches tall, having a mottled yellow and amethyst background with a cameo carved floral décor, brought $3,750; and a Daum Nancy French cameo art glass vase with a beautiful fall season décor and showing great colors, 4 ¾ inches tall, went to a determined bidder for $3,000. 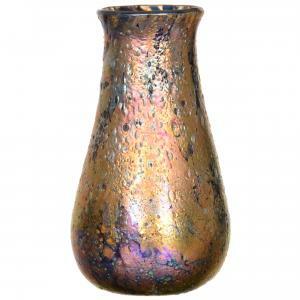 A rare Tiffany Cypriot art glass vase boasting gorgeous colors, 5 ½ inches tall and signed “L.C. Tiffany Favrile 8324J”, knocked down for $6,000. Also, a Tiffany art glass vase, 6 inches tall and iridescent butterscotch in color, with an opalescent pulled feather design with textured diamond quilting and a square mouth, signed “L.C.T. K287”, an example of the highest quality, changed hands for $3,000. A French cameo art glass vase signed Daum Nancy, 4 ½ inches tall and showing three blackbirds on a winter scene background, finished at $3,500. Also, a Mt. Washington Burmese art glass vase, nicely decorated with three full-figure fish, seaweed, and enameled seine net, in outstanding condition, was the top-selling example by that maker, finding a new owner for $3,750. Woody Auction is always accepting quality consignments for future sales. To consign an item, an estate, or a collection, you may call (316) 747-2694; or you can e-mail them at info@woodyauction.com. To learn more about Woody Auction, please visit www.woodyauction.com. Upcoming auction dates include March 24th, April 28th, May 12th (at the Crown Plaza St. Louis Airport Hotel) and May 26th. All are Saturdays.